Dear readers, I'm thrilled to announce a new pattern of Stepalica Patterns - the Zlata skirt. The pattern is for a skirt that has a very interesting detail in a form of inverted box pleats that transform into belt loops at the waistband. And what is a skirt without the pockets? Yes, the Zlata skirt has functional front pockets which make it not only pretty, but also very practical. I've named the pattern Zlata after my graphical designer Zlata from the Muffin Studio, who loved the skirt when I first showed it to her. I like her name, as it means "Gold" or "Golden" in Serbian. I'm not superstitious, but I hope this golden skirt will bring some luck my way. I've been working on this pattern for a long time, from drafting and sewing all the variations, to organizing a pattern testing which gathered around thirty people from around the globe. I'll write about the pattern drafting and preparation in the following posts, so I'll focus on representing you the main features of the pattern in this post. Zlata is a lovely, feminine and figure flattering skirt that every lady should have in her wardrobe. The skirt features box pleats that give it nice volume and flare. The pattern is given in three variations, to accommodate for various preferences. Views A and B have inverted box pleats that transform into belt loops. These unusual details will make your skirt pop among many others. View B has a border which can be enhanced by using fabrics in contrasting colors. View C is another variation on the skirt, which has regular box pleats and no belt loops. The skirt also features fully functional front pockets. Inspired by the '60s, Zlata will be your wardrobe staple. The best thing about this skirt is that it can be made of cotton, linen or wool, making the pattern current all year round. Trim the skirt with piping, trim bands or lace, or style it with a tulle tutu to make it more or less formal looking. The Zlata skirt pattern offers three very interesting variations. The original, variation A has interesting inverted box pleats which transform into belt loops at the waist, thus making this model extremely interesting and eye catching. The inverted pleats form a lovely relief on the skirt which can't be seen often. The variation B is slightly different from the previous one, as it has a bottom border which makes the skirt perfect for color blocking and pattern blocking. If you chose fabrics with a subtle transition between colors, you'll get a skirt which will be extremely attractive while being rather easy to match with tops and jackets. The belt loops give an option for styling with a belt in a contrasting color. 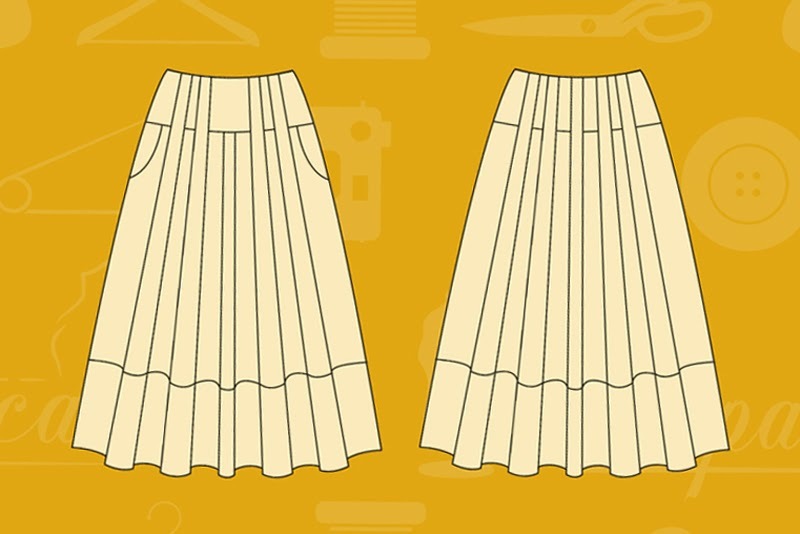 The variation C has classic box pleats that are closed several centimeters from the waist yoke, and fall freely from that point down, thus forming a nice relief on the skirt. 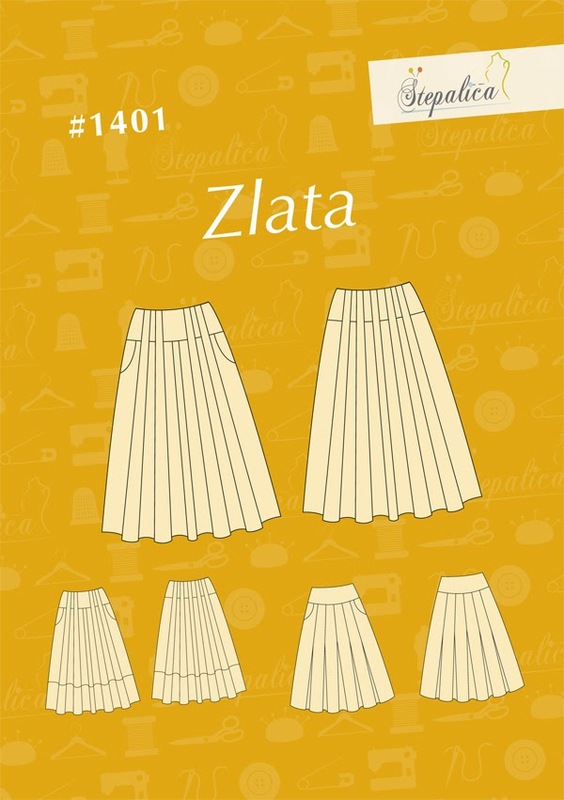 Zlata skirt pattern is given in a range of seven sizes, from 32 to 44. 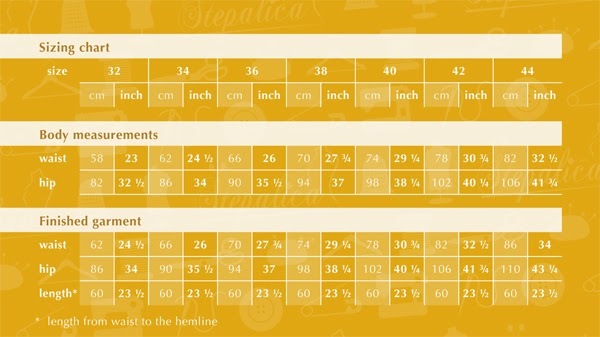 The pattern sheets are separated into two groups by their sizes, so that one group contains sizes 32 - 38, and the other sizes 40 - 44. When I drafted the pattern, I wanted to keep equal or similar proportions of the waist width and the pleats' alignment and width. I wanted to be sure that pleats have similar alignment on all the sizes, and avoid having a pattern where the smallest size has pleats aligned next to the side seam, and the biggest one has the pleats laying over the center of the thigh. This meant I had to draft the skirt in two basic sizes - one for each of the sizing groups grade each of the patterns separately. That was more work for me, but it guaranteed the skirt would look equally pretty on both petites and larger women. Zlata skirt pattern is given in a digital format, as three separate PDF files that can be printed on a home printer, on a A4 or Letter paper format. The pattern sheet and sewing instructions are given in separate files to enable saving paper and ink when printing. 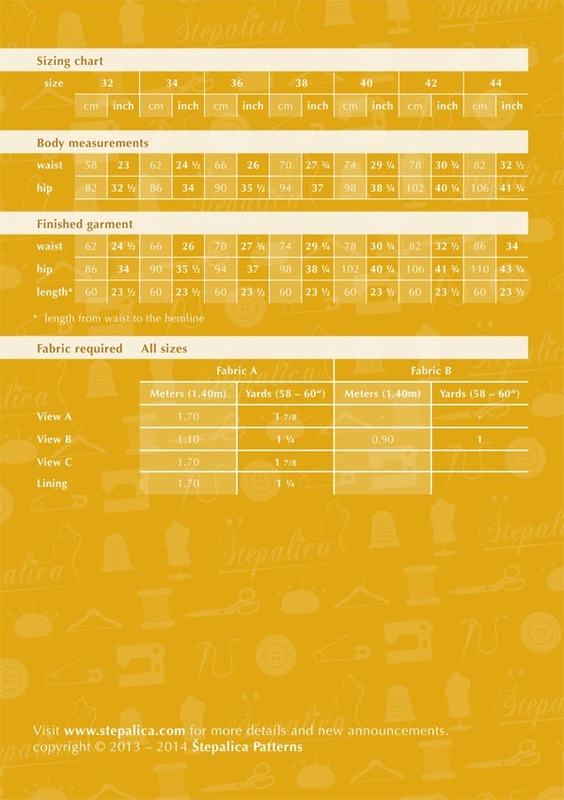 Additionally, pattern sheets for sizes 32 -38 and 40 - 44 are given in two separate files. The pattern sheet needs to be printed, the papers need to be taped together, following the taping scheme that is given along with the pattern. The printer settings should set the Page Scaling to None, and paper orientation to Portrait. The pattern pieces do not overlap on the pattern sheet, meaning you can cut them from the sheet directly. Te pattern pieces do not have seam allowances, so you need to add them when cutting the fabric. The sewing instructions are given in English, with illustrated sewing steps. 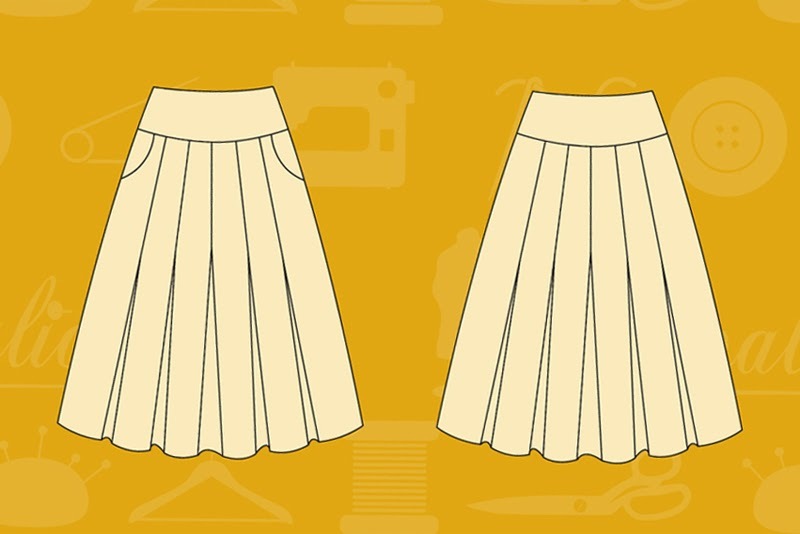 Along with the instructions, the pattern offers fabric recommendations as well as tips for trimming and styling the skirt. 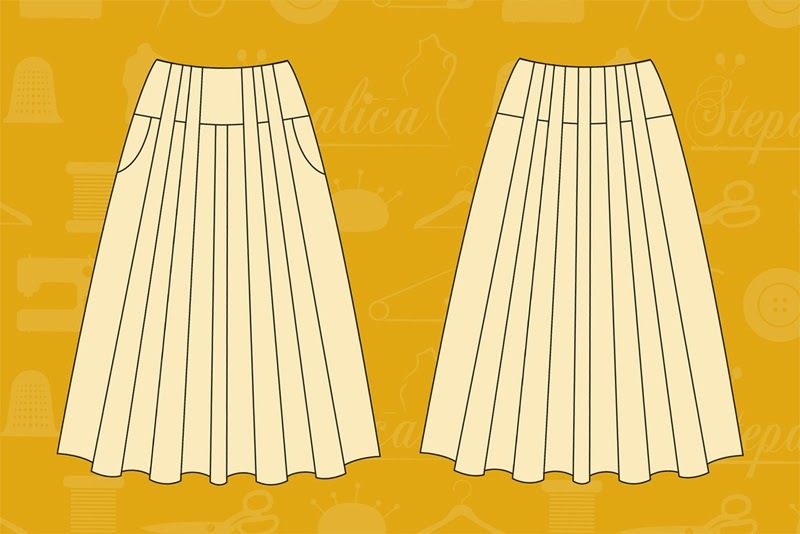 Zlata skirt pattern requires intermediate to advanced sewing skills. The pattern includes only eight pattern pieces (in the case of variation B there are ten pattern pieces), and it's not too difficult to sew, but it calls for a patience, precision and neatness when working. The pattern includes illustrated sewing instructions, and along with that I plan to organize a sewalong which will provide all the necessary information about the sewing process. I love the second and third skirts! The colours you chose for the border skirt are great. Thanks Jodi! The fabric for the border skirt had two sides, and it was a perfect choice for this type of skirt. I had to give the third skirt to Marijana - the model; she's my friend and volunteered for the photo shoot, the skirt looked so good on her, I decided to pay her with the garment. Ana, if you pay the models with skirts... Can I be a model too?